I am using the fingerweight Geilsk yarn, Bomuld og uld. It is 55% wool and 45% cotton with 232 meters per skein. I am pairing it with a lace weight yarn, both yarn colors are a soft powder blue. Just the thing I need to break the gloom of winter. This sweater will be lightweight and airy so it will work for both spring and transitioning into summer. 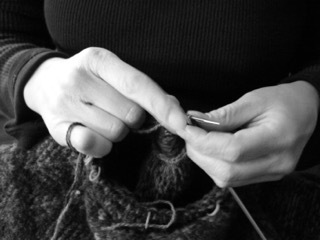 It is time to start those spring knits so you will have them done by the time spring arrives. Also, just arrived are spring knitting magazines, “Knits Spring” and “Knitscene”. Both have wonderful sweaters and accessories to knit. We would love to help you with your spring project, so stop by and get started on a wonderful spring sweater.